Whether you have worked with a marketing agency before or not, there will be some terms that pop-up that make you go, "huh? "Well we are here to demystify these abbreviations and terms! And if you feel like we've missed some -- leave a comment and let us know what other terms in the inbound marketing world, digital marketing world, or marketing agency world that we need to add to this guide. Landing Page: A website page used for lead generation with the focus of the page being a form on the page or conversion opportunity. NOTE: A landing page does not necessarily mean the first page that someone sees on the website. For example, your home page is NOT a landing page. Marketing Landing Page: A web page, not typically found through navigation on your website, used for a specific campaign of lead generation with a form on the page. These pages are typically part of a marketing campaign including high value content. Buyer Persona: A representation of an ideal client that goes beyond demographic information by attaching a personality, mindset, and potential buying decision points to help inform content and marketing asset creation. Call-to-Action (CTA): An image, button, or line of text that prompts your visitors, leads, and customers to take an action. Content: A grouping of valuable information connected to a business that aims to attract and educate customers in the customer sales funnel. Lead Nurturing: The purposeful process of engaging a defined target group by providing relevant information at each stage of the buyer's journey with the goal of moving a prospect throughout your marketing and sales funnel. Lifecycle Stage: A default contact and company property that indicates where a contact or company is in your marketing/sales funnel. Ad Spend: The amount of your dedicated budget that was spent on your campaigns. Campaign: A collection of ad groups that each has its own budget associated to it. Ad Group: A group of similar keywords, negative keywords, and ads. Broad Match Keywords: The most loose keyword option where you are giving search engines the ability to show synonyms, variations, or anything deemed similar to your target keywords. Modified Broad Match Keywords: The most common keyword option that makes specific words mandatory in a search query in order for your ad to show. This is designated with a + before each word or phrase to make it mandatory. The order and placement of the target words or phrases is not important in this kind of keyword. Phrase Match Keywords: For this keyword option, the entire word or phrase is required to show up in the exact order that you've specified. This is designated with quotation marks around the phrase. Additional words can be appended or prepended to the keyword, but the phrase must be in tact somewhere within the search query. Exact Match Keywords: The most strict keyword option, the keyword is exactly what must show up in a search query with no words appended or prepended to the keyword and no variations. This is designated with brackets around the keywords. Negative Keywords: Keywords or phrases that you do not want your ads to show up for. These typically include similar products, verbs, or adjectives that describe a version of your product or service that signal that the searcher is not a good customer for your business. Negative keywords should be added consistently based on your search query information to avoid paying for "bad" clicks. Ad Management Fee: The fee for specialized, daily management of your pay-per-click campaign to monitor data and tweak campaigns in order to create a successful paid campaign. Cost Per Acquisition (CPA): Based on the conversion metrics that you have set up on your pay-per-click advertising, your cost per acquisition is the average amount you are spending in order to convert a contact. A conversion can be a purchase, a page view, a form fill, etc. Your cost per acquisition should generally be your main metric to determine effectiveness of your campaigns. Cost Per Click (CPC): This is the average amount that you are paying for a click. 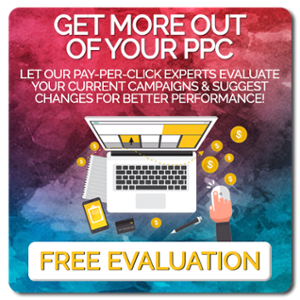 It is a common mistake to only focus your efforts to get the lowest cost per click possible. The problem is that a click does not necessarily signal a win. A $1 click from a person that has no interest in buying your product is a dollar wasted. A $20 click from a person who immediately converts into a customer is money well spent (assuming the value of that customer is over $20!). Reach: The number of people that have seen your ad. These are unique people that have seen your ads. Frequency: The number of times the average person that you're targeting has seen your ad. Impressions: The number of times your audience has seen your ads. A single person (reach) can see (impression) your ad multiple times (frequency). Cost per 1,000 People: The average amount you are spending to reach 1,000 unique people with your ads. Cost per 1,000 Impressions (CPM): The average amount you are spending to have your ads seen 1,000 times. Search Engine Optimization (SEO): The process of helping your website get to the top of search engine results pages (SERPs). The process of SEO includes keyword research, on-page optimization of content, meta content (content that search engines use to understand what your pages are about), back linking campaigns (links from other websites to yours), directory listings, and more. Long-Tail Keyword: A very targeted search phrase that contains three or more words. It often contains a head term, which is a more generic search term, plus one or two additional words that refine the search term. Long-tail keywords are more specific, which means visitors that land on your website from a long-tail search term are more qualified, and consequently, more likely to convert. There is also typically less competition to rank for long-tail keywords. URL: A url is a website address. This can be to a homepage (ex. nike.com) or to a specific page on the website (ex. store.nike.com/us/en_us/pw/air-max-720-shoes). 301 Redirect: A permanent redirect from one URL to another. This is commonly done when a website url has changed or is no longer applicable. A 301 redirect will also redirect any SEO power that the original page had to the new location. Canonical URL: A single URL that is essentially the master copy of the page. This allows search engines to accurately index your page and content without running the risk of getting a duplicate content penalty. Content Management System (CMS): A software program that allows you to build a website or blog while hosting content, files, and multiple users. Examples of popular CMS platforms include WordPress and Squarespace. Domain Name Service (DNS): The service that translates your domain name into IP addresses. This is also where you will add information on how your domain should handle things such as website location, verification, and email. Favicon: The icon that is shown in the navigation bar in a website browser. This is typically the company's logo and should be set to 32x32 pixels. Internal Link: An internal link is a link from one page on your website to another page on your website (excluding navigation). Internal links signal a connection between the two pages which can create a topic cluster (more on this later). External Link: An external link is a link from another website to your website. These are very valuable for search engine rankings. It is believed that external links are the main ranking trigger for search engines. Link Building: The process of acquiring links from other websites in order to rise up the search engine rankings. Domain Authority (DA): A ranking of the authority, power, and trustworthiness of each domain. All domains are ranked on a 0-100 scale and the higher the domain authority, the more trustworthy a domain is in the eyes of search engines. 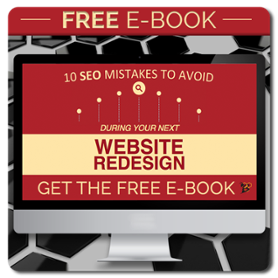 Scores of 0-10 are considered poor/risky - though these can just be new websites as well. Scores of 10-30 are considered good. Scores of 30-70 are considered very good. Scores over 70 are elite. The higher the domain authority of an external link to your website, the more impactful it will be for your website. Meta Tags: This term consists of multiple pieces (meta descriptions, titles, and keywords). Meta tags provide information to search engines about your page and help them categorize your website pages accurately. Meta tags are not seen by anyone that visits your website, but meta descriptions are visible in search engine results. Heading Tags (H1, H2, H3, H4, H5, H6): Headings are important to helping search engines understand what your page is about. The lower the number, the more important it is to search engines. As a best practice, each page should have exactly one H1 tag (no more, no less), no more than three H2 tags, and heading tags should be used sequentially (no using an H4 unless you've already used an H1, H2, and H3). Note: It's a common mistake for websites to use heading tags just for the font size (the lower the number, typically the larger the font). This is a mistake. Heading tags should be used strategically. If you need to change font size, simply change the font size, don't rely on heading tags. Pillar Page: A pillar page is a long form page (typically around 2,000 words) that gives an in-depth overview of a specific topic. This page is at the center of your topic clusters. Topic Clusters: A cluster of pages and content that surround a specific topic that are all connected to the topic's pillar page through internal links. The reasoning behind this concept is that if one page sees a bump in search engine ranking, the other pages in that topic cluster also receive a bump. Alt Text: The text that helps search engines accurately index photos and images on a website. Since search engines cannot see an image, the image's ALT text is what is used to index them. Search Engine Results Page (SERP): The page of results that is shown after a user searches a term in a search engine. Sitemap: A listing of pages on your website that you want search engines to index. Typically the sitemap is not used by visitors to your website, but it helps search engines to accurately and efficiently crawl your website. Directory: A popular and often free location online that you can list your business and website. There are dozens of reputable directories out there (social networks, maps listings, review sites, and listings sites). Directory listings are valuable and important, especially for local SEO). Web 2.0 Link: A back link that is directed to point to a page with an external link that is pointing to your website. The idea here is that a web 2.0 link helps build the authority of a web page that is linking to your website, making it more valuable. Growth Driven Design (GDD): The process of actively updating and improving a website on a monthly basis through interpretation of user data. The way websites have previously been built is that they take three to six months to build, sit mostly unchanged for 3-5 years, then they're rebuilt. The idea with GDD is to constantly monitor user data and make updates on a monthly basis to the website. So, when you get to that three year mark, your website is better than the day it launched, instead of needing to be rebuilt. Above the Fold: Any content that is visible on your website without having to scroll. Cascading Style Sheet (CSS): The language used to style website elements on a page including layout, colors, fonts, etc. Hypertext Markup Language (HTML): The language used to build websites. HTML defines the structure and layout of elements on a website page as well as the page itself. Domain: This is your URL without regard to subdomains (ex: info.hivedigitalstrategy.com), subdirectory (ex. hivedigitalstrategy.com/inbound-marketing), or security (http:// vs. https://). Secure Sockets Layer (SSL) Certificate: The certificate that authenticates the identity of the website while providing secure encryption of the website and its data. Note: in the past, SSL certificates were considered only necessary for eCommerce websites, but search engines have said that they are now giving priority to secure websites. It is recommended that every website utilize a SSL certificate. Really Simple Syndication (RSS): This is a standardized system for the distribution of content from an online publisher to Internet users typically used for blogs. Boilerplate: Boilerplates are a standardized short paragraph used to describe a company’s key facts and messages, and sometimes physical location, in a few concise sentences. An approved boilerplate should be used at the bottom of all press releases and typically includes a company description, the company’s purpose or specialty, size or location and often awards or special marketplace differentiators. Boilerplates are often created at the beginning of a PR campaign or relationship to allow the PR writer and the company to establish tone and priorities of the company collaboratively prior to newsworthy items being created. This aids in a smoother process when writing press releases and answering media request. Press Release: A press release is a written communication that shares specific, but concise information to the media about a compelling aspect or event happening with a company or organization. Though press releases should be written in news story style, it might not be picked up as written, and often is used as one of many sources for a news segment or article. Although a press release is not mandatory for a company to receive media coverage, it is often the best way for small or medium organizations to get noticed in the media and begin positive coverage of their products, services, or events. Media List: A media list documents the key media contacts relevant to a company’s location or industry who may be interested in stories about the business. This list is used to distribute press releases to relevant media for timely, newsworthy content. Depending on a company’s public relation goals, this list could be local, regional, national or international in scope and the size will vary by location and industry. Press Release Distribution: Distribution of a press release is a manual, or software-assisted, process of sending an approved press release to the most relevant reporters or editors on a company’s media list. Through press release distribution, we are able to get your press release and company information into the hands of relevant and important media outlets to spread the word about your company, product, service, or event. Media Kit: A media kit, or digital press kit, is a body of information about a business, product, or leadership team and typically lives in digital format on the business website. This allows media professionals to easily access information and images while creating a news story, segment, or article. A media should include logos, brand guides, headshots, photos, mission statement, and vision statement, amongst other items. Influencer Outreach: Through an influencer outreach program, we will help to identify the influencers that can make an impact on your business, reach out to them, and help to negotiate compensation for promotions. CTR - Click Through Rate: The percentage of your audience that advances (or clicks through) from one part of your website to the next step of your marketing campaign. As a mathematic equation, it’s the total number of clicks that your page or CTA receives divided by the number of opportunities that people had to click (ex: number of page views, emails sent, and so on). Bounce Rate: The percentage of visitors to your website that leave without navigating to a second page. Session: A single visit to your website. A visitor can have multiple sessions on a website. Visitor: A single individual that visits your website. This is typically reset after 30 days. Attribution: The way of understanding which marketing initiative is responsible for an action. Typically this is based on the last place a visitor came from before converting. UTM: The tracking details added to a URL to determine the source, medium, and campaign name in order to accurately track your campaigns throughout landing pages, thank you pages, social media, email marketing, and more. Technical Set Up: Creating accounts and integrations in our software to properly manage inbound and digital initiatives. This typically includes software set up, DNS set up, template development, CRM set up, etc. as outlined in your service level agreement. Account Management Fee: Monthly management of a client's account by a HIVE Account Manager. Tasks that might be included are coordination of deliverables, meetings or calls, analytics review, and strategy sessions. Account management fees are based on the size of the retainer. Point System: A value based pricing option meant to eliminate inefficiencies and ensure that each dollar spent with an agency is used to move a business closer to reaching its goals. Instead of paying for marketing services by the hour or by the project, clients purchase a set number of points each month that can be used to purchase digital marketing services and deliverables. Application Programming Interface (API): A series of rules in computer programming which allow an application to extract information from a service and use that information either in their own application or in data analyses. Customer Relationship Management (CRM): A set of software programs that let companies keep track of everything they do with their existing and potential customers. Key Performance Indicators (KPI): A group of analytics that are used by marketers and executives to evaluate campaign performance in relation to their goals. Microsite: A group of webpages that marketers create within a website to share a different online experience than the overarching site. Service Level Agreement (SLA): An agreement between a company and its customers to define time and effort expectations on response or deliverables. Still looking for a term? 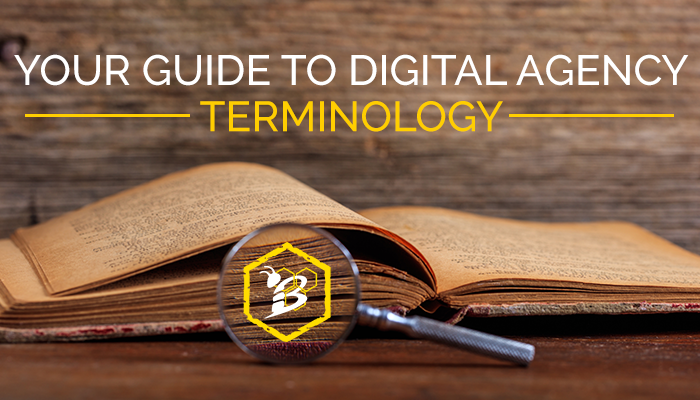 HubSpot has a few additional terminology resources available for you. You can comment below or reach out to us directly for any additional questions or clarifications on our agency terms.